For lots of color and long lasting blooms, petunias in container gardens are a favorite of mine, and for most gardeners. Their blooms are trumpet shaped and well scented. Petunias can range in color from white to pink to deep reds and purples, and may have single blooms, double blooms or ruffled blooms with stars, stripes or contrasting veins. With just a little maintenance, they will bloom all summer. Petunias are annuals everywhere except in growing zones 8 – 10. Double grandiflora petunias are shown above. Grandiflora petunias are the largest type, and also one of the oldest. They grow to 12 inches tall and have blooms that can be 4 inches across. Purples to fuchsia is their color range. 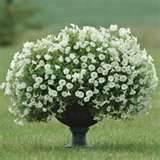 Multiflora petunias are somewhat smaller and more compact. They are probably what most of us are used to growing. These are sometimes called double petunias and come in many colors including stripes. Multiflora petunias are strong and best for windy areas. The petunias above are multiflora. Wave petunias are popular and have a wavy shape to their petals. They can grow well in shady areas and don’t require deadheading. Pinks, lavender and white are their primary colors. Six inches is about the tallest wave petunias will grow. 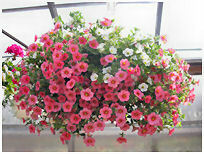 Trailing or cascading petunias grow to 18 inches and are great for hanging baskets. 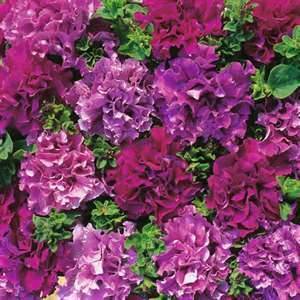 Their colors range from pale pinks to purples and they are fast growing. 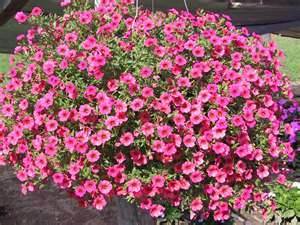 Million bells or super bells are calibrachoa – they bloom in clusters of small flowers with lovely colors of coral, peach, or magenta. Trim spent blooms if needed to encourage repeat blooming. These are also very popular in hanging baskets. The lovely container above is filled with calibrachoa. Petunias in container gardens can be started from seed. However, they are very affordable if you buy the plants at a garden center. 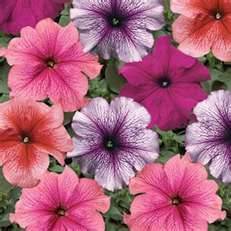 Petunias should be planted in well drained soil in your container and placed in an area that receives at least 6 hours of sun per day. As blooms fade or dry up, pinch them back to encourage more blooms. Just take your finger tips and pinch off the spent bloom back to just above the leaf below it. For calibrachoa, with many blooms, it’s easier to trim with regular scissors or small garden shears. Petunias are not too prone to disease. Most of the problems they get result from overwatering – mildew or root rot are the most common. Remove faded blooms and leaves with any brown spots as soon as you spot them.